It's simplicity gave it universal appeal. Who doesn't like a tree? - well...who, besides Actor/President Ronald "Seen one tree, seen 'em all" Reagan, and his less-articulate Republican Guard heir to the throne, George Dubya? This design was reproduced in newsletters, stickers, t-shirts, banners and signs by anti-nuclear alliances and groups all over the world. 35 years after we printed this design we noticed a similar design with treees was used during the Great Depression by the Civilian Conservation Corps on a 2" patch. Deja-vu. Nothing new under the sun. What goes around comes around. Everything old is new again. In the mid-1970s there was a store in New Yotk City called Stonehand, specializing in antique wooden and metal raised type and illustrations for letterpress printing. We purcased our drawers of wooden and metal type there, ranging from quarter-inch to 3-inch in size. That type was what we used from 1975 through 1984 to hand print one-of-a-kind bumperstickers and signs for our fledgling mail order business. We were one of three places in the country that offered single custom printed stickers - and at $2 for one! At Stonehand we found an old engraved cut mounted on the standard 3/4" wood base, the kind used for illustrations and logos used in letterpress printing. It was of those trees. We hand printed it and enlarged it to 9 inches in diameter abd added the words "NO NUKES" using rub-on dry transfer letters in Windsor font. That became our best-selling t-shirt ever, which we started out silkscreen printing ourselves in our house. We also produced it as a one-inch button and rubber stamp and a 3-inch sticker, and embroidered patch. 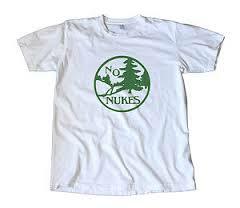 A 2014 Google search of the words "no nukes logo" yielded hundreds of various other images from the 70s, 80s, 90s and 21st century, including some other buttons that we have printed for other organizations over the decades. Way down toward the end was a photo of our logo on a t-shirt, a lighter-color shirt and without our name or © 1977 or the union label. It was our design being sold by an eBay company in California that sells "vintage" logos reprinted on new t-shirts. They never asked us to reprint the design or to remove our name and © tagline. But they had to have deleted our tagline to make their reprint.